Very high up on a hillside, with wonderful panoramic views over Troulos bay and the Aegean Sea in a peaceful, rural location is the Paschalis. In separate blocks, it offers light and airy studios for 2 and spacious two bedroom apartments for 4 people. A cleaner came in every day to empty the bins and sweep the floors. It's only a quick walk to get to one of the many local tavernas or a 20 min bus ride into town for even more choice. Up a steep hill with amazing views. Great pool. Honesty bar works well. These apartments are superb. Although there is a steep walk from the troulos main road to get to them, the veiw from the balconies is sublime. 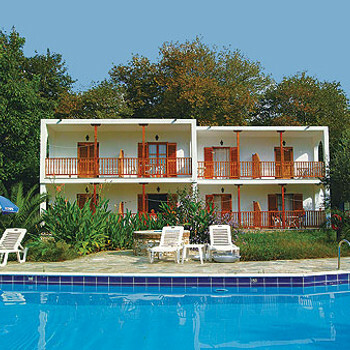 The family who run own the apartments are very hospitable and friendly. There is newly installed air conditioning available and this was a blessing as whilst we were there temperatures exceeded 42 degrees centigrade. Although there is no entertainment as such, the Manos Rep does do a weekly quiz night. The pool bar is fairly peaceful in the evenings but it was nice to relax in such tranquil surroundings. We will be returning next year. These apartments were simply furnished, large and spotlessly clean. The veiws from the balconies is absolutely sublime - a liitle peice of paradise. We found it very difficult to tear ourselves away from the veiw to look at other aspects of the island. Although it is a steep walk to the apartments, the view makes it worthwhile. But we did find it beneficial to hire a jeep for some of our stay. The family that own the apartments are very hospitable and kindly allowed us to practice the little Greek that we did know. When we left we felt that we had been treated more as friends than customers and hope to return this year. -the food is up to you as your to make it your self, but the kitchen is fully equipped with all necessary items for cooking regular meals. -the man who maintained the pool and I'm pretty sure he owned the property, didn't speak much English but was very kind and always picked grapes for us when we were around. -I would defiantly visit this hotel again, it was beautiful.